WOW – August’s edition of Puzzle set new standards in musical mayhem, with top notch sets from all the Puzzle residents and some truly awesome guest DJs. Big thanks to Mazieg and Mat Lock who treated us to some of the finest underground trance and psy about. Man on fire Ali Wilson proved just as exciting as we expected – his set was packed with jaw dropping tech trance and his own sublime productions, and really showed just what all the fuss is about! His spontaneous back to back session in conjunction with our very own Ali Cantor proved one of the highlights of the night, ripping the roof clean off the 414 and leaving the crowd begging for more. Yes that’s right, London’s biggest small party is 5 years old and to help our birthday go with a bang we’ve put together a line up packed with the very finest purveyors of full on party music! First up this month is London legend Nick Sentience. Having defined the dance music of a generation with his unparalleled run of hits while at Nukleuz, Nick’s currently showing the trance world how it’s done with a series of very well received releases such as ‘Heist Manouevre’ and ‘Kinetic’ on John O’Callaghan’s imprint, Armada sub-label ‘Subculture’. After we booked Nick for May’s party and he left the 414 dancefloor in ruins with a blistering set of full on tech and psy trance, we knew he was an essential booking for our birthday extravaganza. Expect the very best in upfront tech and psy trance all in Nick’s trademark driving style – not to be missed! 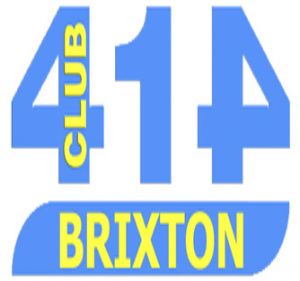 Like many a classic line up of old Nick will be joined by Frantic legend Phil Reynolds – time and again over the years Phil has proven himself the UK’s premier party DJ, so who better to invite along to our birthday celebrations? Phil has one of the very best set of ears around for simply astounding trance and tech trance and he’ll be dropping a set packed full of driving basslines and soaring riffs that is sure to send the 414 stratospheric! This month we’d also like to welcome our very own Timmy Whizz! A true scene stalwart Timmy runs the hugely successful reFre5h afterparty and we thought his infectious brand of pumping euphoria and chunky beats will fit the celebratory mood perfectly. Make sure you don’t miss this party animal in full swing! 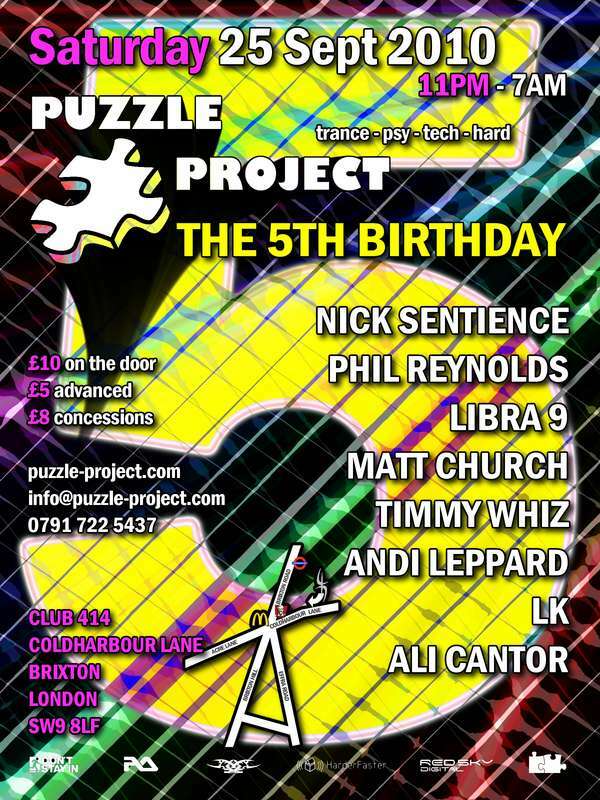 And of course our birthday party wouldn’t be complete without London’s best team of underground resident DJs, the bedrock on which Puzzle Project is built – for our birthday the whole team will be making an appearance. In the psy trance corner we have newest addition to the residents team Andi Leppard (Halcyon, Illuminaughty) one of the country’s finest psy trance talents, and of course no party would be complete without the jaw dropping talents of Phil Lankester aka Libra 9 (Halcyon, Party Proactive). These two pack a deadly combo of CD wallets full of filthy full on psy with some fairly nifty skills behind the decks, anyone who’s caught either of them play will know they’re in for a wild ride through the Psychedelic sound! Bringing the noise in the trance corner is our own holy trinity of trance maestros – Ali Cantor, LK and Red Sky Digital head honcho Matt Church. All three are masters of their craft, they’ll be showcasing the full spectrum of trance, from dirty funky house and progressive, through spine tingling euphoria to banging tech trance. Expect the spectacular! 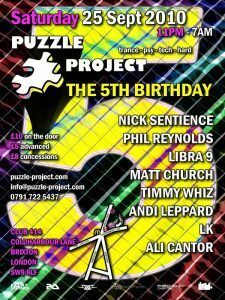 So there we have it – more of the very biggest DJs you’re likely to see in the intimate surrounds of the 414, London’s finest team of underground dance music residents and the famous Puzzle crowd surely add up to one electrifying birthday party – only fitting for London’s biggest small party!